This is a generations-old recipe that is perfect if you love that sweet and salty flavor combo. 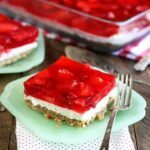 The salty pretzel crust, creamy filling, and tangy sweet strawberry topping make it one of our favorite desserts. In fact, this might be Heather’s all time favorite. She’s a huge strawberry fan. There are probably a hundred different ways to make this recipe. 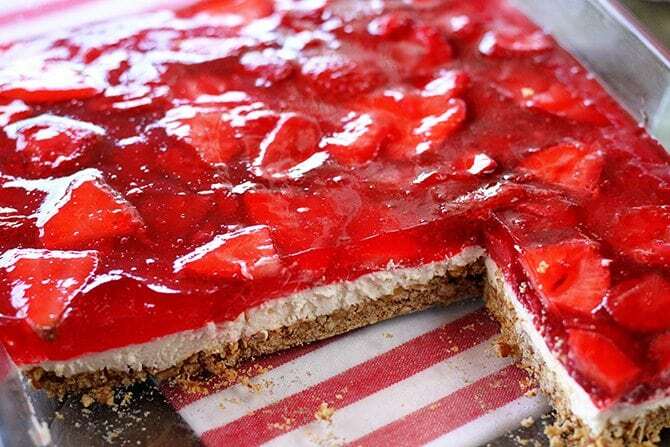 In fact, it is traditionally made with frozen strawberries and I’ve included those directions in the recipe. However, I saw one of my blogger friends post a recipe that used fresh strawberries and knew I had to try it that way. I immediately loved that version even more. I’m not a huge fan of the texture of the frozen strawberries. They’re softer and make cutting it much easier, but I just really like the flavor and texture of the fresh strawberries better. It’s good either way and it’s great to have the option of using the frozen berries when fresh ones aren’t in season. Regardless, y’all are going to love this. It might seem a little weird to some, but just try it. 🙂 Y’all enjoy! Preheat the oven to 350°F and lightly spray an 9x13-inch baking dish with nonstick cooking spray. In a medium bowl, combine the crushed pretzels, granulated sugar, and butter. Mix well. Pour the mixture into the prepared dish and press it evenly to form a crust. Bake for 15 minutes then allow to cool completely. In a medium bow, use a mixer to beat the cream cheese until smooth. Add the powdered sugar and mix well. Fold in the thawed whipped topping. Once the crust has cool completely, spread the cream cheese mixture evenly over it. Chill in the refrigerator. In a large bowl, whisk the gelatin mix with the boiling water until dissolved. Add the strawberries. (If using frozen berries, there's no need to thaw them.) Chill the mixture until it thickens to the consistence of egg whites, then pour over the cream cheese layer. Chill until set. Slice and and serve. 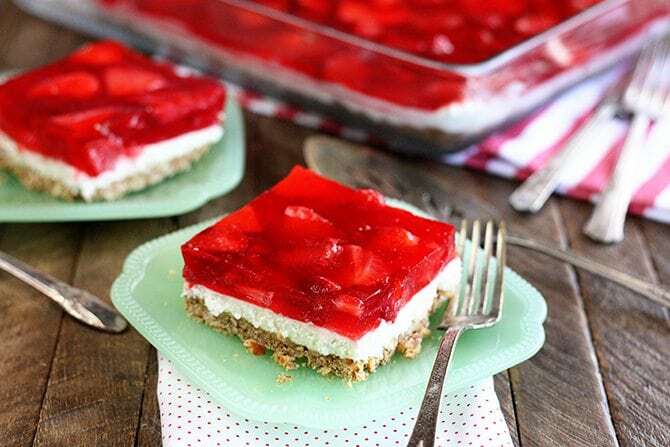 My favorite summer-time dessert. You’re right; the sweet/salty combo is irresistible! Church luncheons wouldn’t be complete without this making an appearance. Stacey, I first had this at the Iron Gate Tea Room in Decatur, AL. I’d just moved to Huntsville as a young bride some 45 years ago and my friend and I had lunch at the Iron Gate. 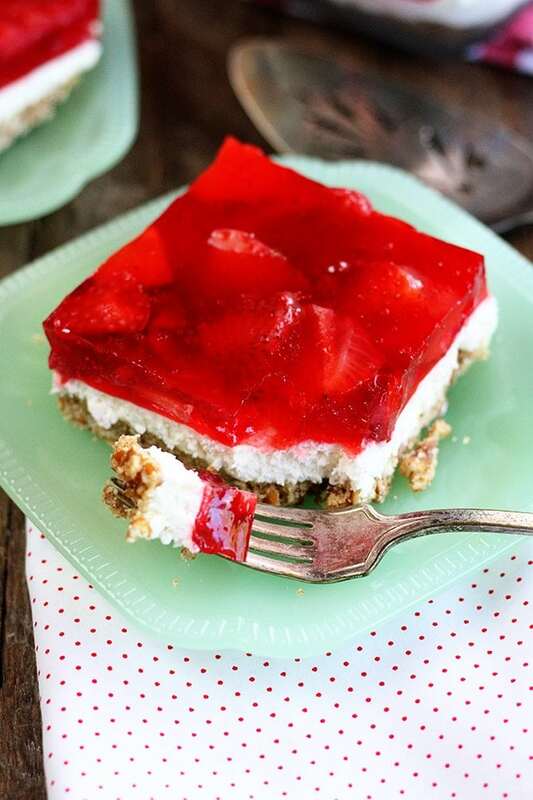 I don’t remember what else we had, but I do remember the delicious Strawberry Pretzel Salad. What a treat. Thanks for the sweet memory. My dear friend is gone, but we shared some great times, and, of course, what are great times without great food? I just love how food can take us back like that! Thanks for sharing your sweet memory with us! for Patti Moss….I also went to the Iron Gate JUST for that dessert! So glad to have found it. I’ll make it this weekend. If using frozen strawberries, would I be correct in assuming you would use the ones that are sweetened? Love all your great recipes! Thanks! Either sweetened or unsweetened will work. Sometimes I think “salad” is the go to word when folks don’t know what to call something. If it had a cookie crust it would be a dessert, no one sees pretzels as a dessert S-O it’s a salad. Whatever you call this it’s really good, just eat it within a day or two, soggy pretzels are nasty!! 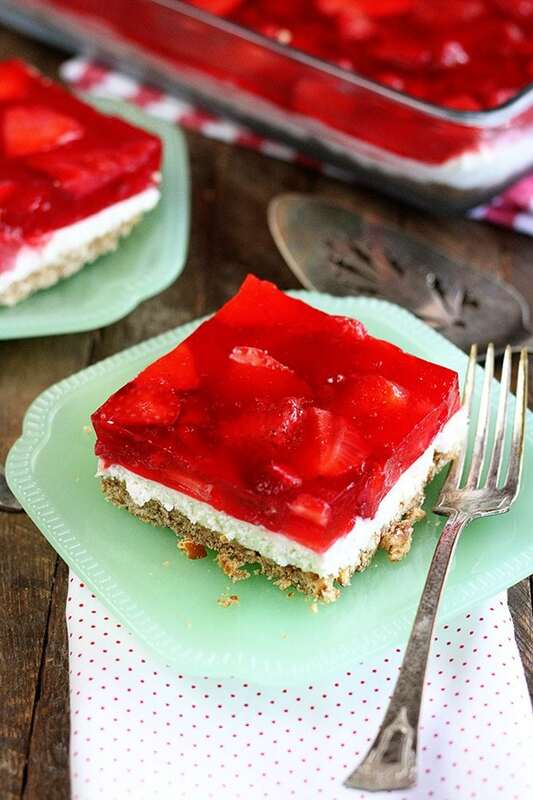 You had me at Jello, but this sounds like an awesome twist on it. Pinning it for later. Thanks for sharing this with us. 2 cups of crushed pretzels, yes they were crushed when I measured them, doesn’t make a crust as thick as you show. Yes I did use a 9×13 dish. We make this every year. But I use Raspberries and raspberry jello. It’s so delicious-I make one for Thanksgiving dinner and one for the kids to split and take home with their leftovers. And I use home made whop cream I stead of coolwhip. We make this every year. But I use Raspberries and raspberry jello. It’s so delicious-I make one for Thanksgiving dinner and one for the kids to split and take home with their leftovers. And I use home made whip cream I stead of coolwhip. Sounds like a delicious twist! !